Amazon's Choice for "everteen intimate wash"
Sold by Wet & Dry Personal Care (4.5 out of 5 | 327 ratings) and Fulfilled by Amazon. Gift-wrap available. Sold by Wet & Dry Personal Care and ships from Amazon Fulfillment. everteen® Menstrual Cup for Women- 1pc (Large, 30ml) with storage pouch- 12 hours Leak-Proof Protection. Have period with no smell, no discomfort. 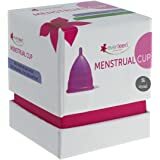 everteen® Menstrual Cup for Women- 1pc (Small, 23ml) with storage pouch- 12 hours Leak-Proof Protection. Have period with no smell, no discomfort. 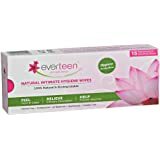 Everteen Natural Intimate Wash is scientifically designed to promote body's natural vaginal balance and maintain complete vaginal hygiene. 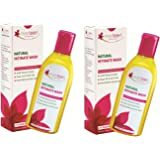 Trusted as the best feminine hygiene wash with antimicrobial properties of 100% natural active ingredients, Everteen inhibits bacterial growth causing infection, unpleasant odour and irritation in intimate area. 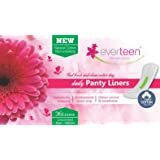 Daily use of Everteen helps in preventing infections and gives relief from consistent itching or burning in intimate area. The feminine hygiene wash by Everteen prevents infection, itching, irritation and unpleasant odor. 2.0 out of 5 starsNot sure for the manufacturing details.. Received my parcel today, disappointed as the packet was not sealed.. 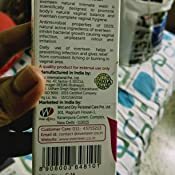 So not sure of the manufacturing date, though it is mentioned aug 2018.. Plz dont open the packet, as these products are used in intimate parts, so very sensitive and precautions should be taken. We have the right to know proper manufacturing detail and hence the packet should be sealed properly to ensure our mental peace... Thank you.. The product cleansing properties are wonderful and mind blowing I love the product but one star is for the seller named as "wet and dry". His old mfg products are not selling hence he's giving out to Amazon customers reason we can't have a view while buying?this product lasts for 7-8 months for me. Now as per the image attached it will extend beyond the required expiry date. 1.0 out of 5 starsDon't recommend. It's a fake or the product is like this only. It's smells really bad. After finishing one bottle which was decent, thought I will re-order it. The first one was fluid, in the second order the product was all gel, that too with a foul smell. The manufacturing & expiry date were scraped off. Would not recommend this. Very useful during periods as well as in normal days feels like baby wash. A pea size is enough to leather. Smells nice. And quantity of product is enough to last long. Loved it!